Today's morning tour of Laidlaw Memorial United Church saw a crowd of over 35 people coming from Hamilton (including Ancaster, Dundas, Stoney Creek) and as far as Dunville, Burlington and even London Ontario! They were here to learn about the energy conservation measures and deficit slashing that Laidlaw has accomplished in under 6 years; bringing their budget deficit from $54,000 down to $8,000. From installing a 7-day electronic set back thermostat,turning off the pilot lights when not in use, starting up Breakfast and Brooms (where people eat then clean the church), turning off the water heater in the summer to moving the heat ducts from the ceiling to the floor, setting up a convection current and making the gym warmer and using less fuel right up to getting ready to install solar panels on the new roof, people learned that the process was and continues to be a communal effort, a familly thing with everyone working together. Rev Doug Moore thinks of his congregation as being part of a household "just doing what a household does." What I came away with from the interfaith panel discussion that followed the workshops was that what we are developing is trust between the faiths. What a powerful concept:imagine what the world would look like if we could trust one another! 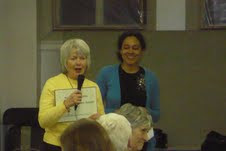 I presented the awards For the Hamilton area. We had two faith communities that started their 'greening journey' in two very different ways. One that set out intentionally on the 'noble path' and the other that didn't even realize they were on it. “doing nothing” with regards to greening. Independently the Youth Representatives of the Niagara Diocese put forward a motion at the 2007 Synod to ask that every Anglican church in the diocese be accountable for the amount of GHG it was emitting. St James is now a shining example of a church that's implementing the accreditation program for the whole Niagara Diocese coming out of that first initiative. 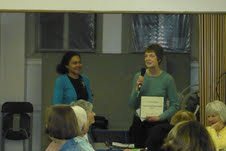 St James is one of 5 churches that passed the bronze level of this accreditation programme. They are currently working towards the silver level. St James has had a walk-through audit and as a result, has taken many practical energy conservation measures. They have held 2 celebration feasts of delicious locally produced food; they have installed a bike rack to encourage getting to worship by active transportation instead of driving, they offer regular recycling/composing/green bin education to the community at large. Groups using the church are being given the Blue box talk to encourage correct use. They have helped develop a green cleaning products guide that FCG has adapted. St James is a very active member of the newly formed Eco-Churches of West Hamilton and they are heavily involved with climate change activism. The world wide events in October, leading up to the Copenhagen talks in Nov saw it's members taking to the streets, writing letters to the government and educating people about the need to take action on climate change. The Reverend at this church, Rev Doug Moore admits that they didn’t start off trying to be green. They started off with a budget deficit. The story begins with the pipe organ. Some of the members thought that turning down the heat in the Sanctuary during the week might help the deficit, but there was the pipe organ to consider. They'd been told that the pipe organ had to be at 65 degrees all winter to be preserved. After much talk they came to the decision to invest a little over a hundred dollars in a 7-day electronic set back thermostat. They set it up to be warm when people were going to be there, and cool when people were not going to be there. By the time a year had passed, the heat bill was $1000 less. The organ was fine. And for your information,six years later, the organ is still fine, better, perhaps, for the leathers not getting all dried out from the heat in the winter. From there, ever practical, more ways to save money started coming up. The pilot lights on the kitchen stove could be turned off until someone needed to use the stove (that saves $250 in gas each year), and the water heater turned down for the summer. Changing the furnace filters helps make the furnaces more efficient. Ideas just kept coming. Someone heard of a deal on Compact Florescent Lights. Everybody gathered their extra coupons, and they bought enough to replace seventy bulbs in the Church, now saving $50 a month on the hydro bill. Someone else heard about free upgrades to the existing florescent lighting in the Church to T-8’s (high efficiency fluorescent lights), and the Utility Company did $1000 worth of free upgrades. When the Church School wanted to decorate the sanctuary for Thanksgiving they made the effort to not get in cars, but to buy local, and went to the local Farmer’s market, and decorated with the vegetables they bought there. In the Office, they started cutting down on photo copies and paper. Cleaning now involves fewer chemicals, and more elbow grease. When people kept cranking up the heat in the gym because they were cold, and when everybody saw the heat bill going up, they talked to their heating contractor, who moved the heat ducts from the ceiling to the floor, setting up a convection current, and making the gym warmer and using less fuel. In conclusion, Rev Moore tells us, “It just made sense for us to start thinking, all of us, together, about how to save money, and being green was saving us money, and time, and increasing the cooperation and affection we had for each other. The more we got to know each other, the more our Worship became a deeper celebration. Helping each other be respectful of God’s creation, and enjoying each other’s company gave us a sense of friendship that allowed us to celebrate God’s provision for us, and believe our little world might be saved, after all." Laidlaw United has recently received $$ to install solar panels this spring and generate green energy that they will be used to feed into the grid. They are offering a tour of their church march 17th and the following month, we will be hosting a solar forum for faith groups, businesses and home owners all! Why have an energy audit? Whether you are a temple, church, or gurdwara, an energy audit is as important to any long-term capital plan as a thorough building condition assessment. The major benefit of energy audits is that they allow for the development of an "energy savings plan." The energy savings plan contributes to the implementation of a capital plan by providing funding from reduced utility bills (in the form of money not spent on utilities) and, to a lesser extent, government subsidies and grants. This augments other sources of funding including reserves and investments and is used to cover the costs of implementing a capital plan. Including energy audits in capital planning also allows for a holistic approach to planning by incorporating energy efficiency decisions into long-term maintenance programs, equipment acquisitions, and renovations or improvements. It's true it costs to get the audit and to do the renovations, but the long term cost of doing nothing is probably more. Consider it part of the commitment to living faithfully, living green. * Green Venture is a not- for- profit organization with years of experience in conducting energy audits. They offer free estimates (provide them with square footage and annual heating costs). *If you are a Union Gas customer, now's the time to get an audit! Union Gas will pay up to 50% of your energy audit costs. Don't miss out on this opportunity while it lasts. 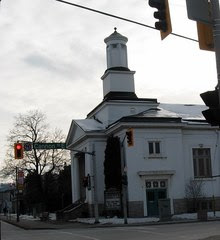 On Wednesday March 17th at 10am Laidlaw United Church will host a guided tour of the church to demonstrate how simple energy conservation action has *drastically* reduced energy bills. Come out and learn how they've done it. 155 Ottawa Street North (corner of Ottawa and Cannon). This past week, True City hosted a fabulous 'Celebration'event Philphott Memorial Church in down town Hamilton and what really interested me was the prayer room. It was a space that contained prayer stations: Listening station,Worship station, Neighbourhood station, New arrivals station, Living rock (street youth) and Native stations, Global station, Mental health station and Environmental Station. I was deeply moved by much of what I saw. An interactive opportunity, people were invited to contribute their thoughts, art etc. At the Environmental Station, there were many useful tips/thoughts/ideas left by people who had stopped to pray there. One of them was "We must humbly learn from the Environmentalists." Yes, we should learn from the environmentalists.We should to emulate their commitment, their sense of justice, their fervor to see this world return to what it was once before-a glorious, mysterious, beautiful world. But I also believe that there is much to learn from people of faith. There is compassion for the ones that no one cares about. There is hospitality towards others. There is community and relationships and trust. Can we use these qualities to be better environmentalists in our own communities?